The brand new Toro Z Master Professional 5000 series now comes equipped with a rear discharge cutting system, allowing the driver to cut using either side of the deck. Which is highly practical when mowing near garden beds and pavements as you don't need to change the mowers direction to avoid discharging grass onto these areas. 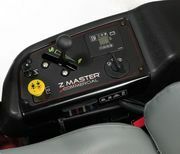 The Z Master Professional 5000 Series are sufficiently quiet, economically great on fuel and have a very high blade speed enabling it to handle taller grass. Meaning the Z Master Professional 5000 series are ideal for commercial mowing, large blocks, roadside mowing and areas where the grass clippings must be kept in line with the mower. Fitted with a huge 60" cutting deck. 24" x 12" - 12"
High strength heat treated blade provide a flat superior cut while withholding the strength to survive impacts. This deluxe suspension seat is thickly padded and is constructed on 3-D isolator mounts that absorb the rough terrain you may encounter. The 7 gauge bull nose bumper protects the deck from front on impacts making it more durable and longer lasting. It also acts as a underskirt to minimise blow out of debris and dust. The control pannel to your right of the machine displays an hour meter, fuel gauge and voltage meter as well as diagnostic indicators for the safety interlock system. 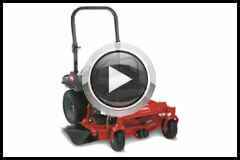 The rollover protection system accompanied by a seat belt is incorporated into the Toro 5000 series. Protecting the operator from potential rollover accidents. 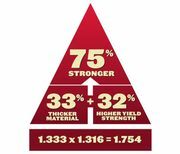 The Turbo Force deck provides a huge amount of strength while still maintaining a superior cut while increasing productivity in extreme mowing conditions.